If you’re a cheese lover or just simply loves to make a sandwich, choosing the best cheese slicer is very important to give you efficiency and reduce the time for meal preparation. Maybe you’re guilty of using a knife to slice a cheese, a knife alone might not give you perfect results in slicing various sizes of cheese, and it is a good idea to opt for a special cheese slicer that will do the job. Wide-range of Cheese slicer brands are available on the market, in this article, I will share you some tips and reviews, and a list of the best cheese slicer on the market today to help you for your purchasing decision. What are the benefits of using cheese slicers? What are the Things to consider before purchasing cheese slicers? As the name implies, cheese slicer is a special tool (you guessed it right) for slicing cheese. It is used for cutting hard and semi-hard cheeses that produce an even and thin slices. Cheese slicers come in different styles designed for different hardness and also used for other ingredients such as cold butter, cucumber, cabbage, or zucchini. The cheese slicer is invented by a Norwegian carpenter named Thor Bjorklund in 1925. The idea started when Thor (Not the Marvel superhero) become irritated when he couldn’t get the perfect slice of cheese using a regular knife, he tried all the tools in his workshop and finally worked with a Planer. In 1927, the production of cheese slicer is 50 million and contributes to Thor’s success. To this day Cheese slicer’s design, quality, and the price have been innovating. Cheese are available in different varieties and one of the most commonly consumed dairy products globally, its versatility can be used to make tons of different delicious snacks, pasta or any kinds of dishes or just simply enjoy it by itself – there is no wrong way to indulge its deliciousness. One of convenience cheese slicer offers is that it is easy to use and easy to store as well. Modern cheese slicer comes in manual operation which gives you a control on how thick or thin your slices come out, it allows the user to make delicious dishes tailored to their exact preferences. Other utensils or tools in your kitchen drawers are designed for specific uses, so it is a good idea to invest in a quality slicer for carving any wedge, block, or wheel of cheese. In short, having a good cheese slicer reduces the time and energy spending on non-suitable tools for any meal preparation. Provides a thin and even slices. Cheese slicer offers the best result when it comes to shaping and trimming blocks of cheese for your delicious dishes and sandwiches. Display. If you’re using regular or a dull knife especially when slicing very soft types of cheeses, it will be messy. So it is advisable to use this special tool designed for cutting both soft and hard kinds of cheese that will definitely give you better slices and presentable results. For example, cheese and wine become perfect partners for enjoying small talks or on special occasions, serving your guests with a perfectly sliced cheese will definitely make it look amazing and elegant as well. Time and energy saving. As said earlier, using cheese slicer can save you time and effort for different meal preparation. For example, assuming your using kitchen knife to slice a cheese chances are you have to sharpen it first to achieve perfect and desired results but with cheese slicers especially the Wire types you can just replace the wire quickly and expect better results. Affordable. The prices of cheese slicers in the market are lower compared to regular kitchen knives. However, it still depends on the material used for its durability, so it’s important for you to pick the best one. There are many types of cheese slicer for different varieties of cheese based on the texture and hardness, let’s take a look. Cheese plane comes with a flat surface and a sharp edge on the hollow part of its center that’s used to scrape off very tiny slices of soft cheese by pulling the built-in blade across the cheese’s flat surface to slice it. Usually made of metal or stainless steel and modeled from the carpenter’s plane. This type of cheese slicer is commonly used for cutting cheese for sandwiches and other appetizers. 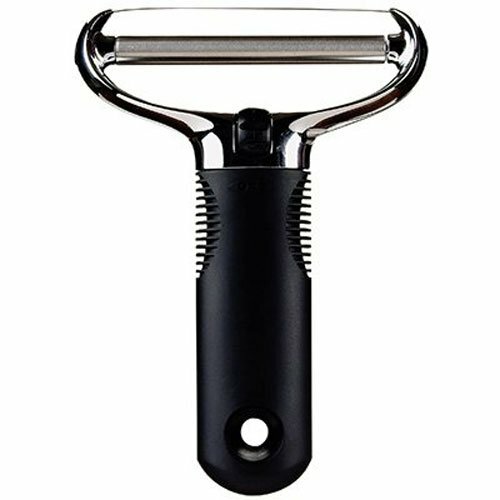 As the name implies, this type of cheese slicer is great for cutting cheeses with different thickness mainly because it provides adjustability for any semi-soft and hard types of cheeses. It comes with a stainless steel wire that makes the cutting easier depends on the size and thickness of the cheese block. The stainless steel wire may break but good thing is, it is replaceable. For the slicing mechanism, they also consist of the solid handle that splits into a T-shape together with a roller and the stainless steel wire. Wire cheese slicers usually come with a wooden cutting board and will take up more room than the other types of cheese slicer mentioned above. The cutting board serves a container for the sliced cheese and it also includes an attached arm with a wire to create a perfectly and evenly sliced cheese. It is great for cutting soft and semi-hard types of cheese. Wood. Usually made from hardwood or beech wood. Wooden slicing board offers lightweight materials for easy maintenance. Marble. Marble slicing board is the best to use primarily because it offers non-stick surface, aesthetic look, and keeps the cheese cool and fresh. Stainless Steel. The great thing about stainless steel slicing board is you don’t have to worry about rusting and it has been known for its damage resistance which contributes to the longevity and effectiveness of the whole cheese slicer. To check out if you’re slicing the cheese in the proper way, here are some useful tips for cutting cheese perfectly. Remember to always clean the cheese slicer before and after use, this will ensure that no bacteria will build-up and for its durability and effectiveness as well. Never ever cut the cheese in a single fluid motion. Store your cheese slicers in a safe place to avoid accidents for your pets and young ones. Let the cheese to reach the room temperature before cutting, this will make it easier to cut. Things to remember that may impact the thickness of the slices are the angle at which you hold the cheese plane and the pressure you apply to it. Picking the best cheese slicer that suits your cheese cutting jobs for different types of cheese is very important, this will have a significant impact on the efficiency of your meal preparations. To help you with that, I’ve listed some of the factors you should consider before buying one. The number one thing that contributes to the best cheese slicer is safety. It is the key to every kitchen tools as well. Using a regular knife is a bit dangerous, it the main reason why you should opt for cheese slicer. You don’t want to slice your fingers right? So it is advisable to opt for cheese slicers that offer non-slip handle and non-slip cutting board. Some models include a cutting board with rubber feet that’s the best one. The cutting wires should be also well-secured and tight in order to avoid any breakage which may cause accidents while in use. The best cheese slicer must be easy to use and offers adjustable wires for any thickness of the cheese. Only a few models offer this adjustable wires, so if you found one, you should buy it. When using cheese slicers, it shouldn’t hurt your wrist, it must be straightforward and comfortable. Controlling the thickness is good, however, it is not a good idea to opt for complicated ones. Easy-to-clean is the most common thing that not just every cheese slicers must have but also in every kitchen tools you purchase. There are some models in the market that may stick into the slicer. Opt also for dishwasher-safe models. Instead of using the dishwasher, you can wash the toll with your hands and wipe it with a damp cloth to ensure the sharpness of your cheese slicer. Some of the cheese slicer models in the market claim to be durable, but in the end, they’re not. So it’s better to research and look for the reviews on that product. The material can determine how durable your cheese slicer is, common material such as stainless steel and zinc alloy is the best choice mainly because they’re corrosion and rust-resistant. To avoid constantly buying of a new one and save you money, avoid cheap ones and always opt for heavy-duty models that can withstand the pressure when you slice any types of cheese. To ascertain the durability of any product you’re buying, always opt for a cheese slicer that offers long warranty and satisfaction guarantee by reading the reading terms. However, to avoid replacements, you should use your cheese slicer in a safe and proper way in the first place. People tend to have different specific needs when using cheese slice, having a versatile one that can be used for any needs is important and will make sure you won’t regret spending money. The durability of the cheese slicer may not only depend on the material used but also rely on how you maintain and properly use it. Most of the consumer’s looks for affordable tools, however, keep in mind that buying such tools may not be effective for long-use and chances of constant replacement might be high. Addressing the controversy, some people still believe that having a cheese slicer is not that important as long as they have regular kitchen knives to cut cheese, but to be honest, cheese slicer is quite important for giving you better and even slices and it is specially designed for cutting all kinds of cheeses. So to oppose some people beliefs, choosing a durable and suitable for long time use cheese slicer is important. Now, it’s time to take a look at the list of best Cheese slicer on the market that you should probably own right now. First on the list, is this cheese slicer from the Bellemain manufacturer who is trusted for their high-quality kitchen equipment by carefully analyze their own market research to meet the customer’s desires. The best thing about Bellemain adjustable cheese slicer is that provides you the best results and even thickness of the slices. It can cut through any hard, semi-hard, or soft cheese in just one smooth slide. It also comes with an additional cutting wire made from stainless steel for replacements. The durability of this cheese slicer is excellent, it offers easy to clean zinc alloy body that will definitely great for long-term use if maintained and used with proper care. If anything goes wrong, don’t worry because it offers 1-year warranty just in case. Offers Adjustability for any thickness of the cheese. Comfortable handles and made from durable materials. Versatile, it can cut through any hard, soft, or semi-hard cheeses. The product includes an Additional stainless steel wire that you can easily replace. Backed with a 1-year warranty. The operation might be difficult because of its small handle. The cheese slicer needs 2 different screwdrivers when replacing the cutting wire. The wire may loose or break and may not be good for long-time use. If you’re looking for a nice-looking cheese slicer that also offers the best thickness of cheese slice, then Fox Run 3841 Marble Cheese slicer suits just for you. It’s the most trusted kitchenware that runs on the market for over 40 years. This cheese slicer is a straightforward product with a nice marble board that keeps the cheese cool and fresh. The base also offers non-slip rubber pads to maintain a good grip when you cut the cheese and also it is easy to clean, but it is advisable to use hand wash in order to avoid damage on the cutting board. The stainless steel wire is designed to easily cut any hard, soft, or semi-hard cheeses, In care of wire breakage, this product includes 2 extra cutting wires for replacements. 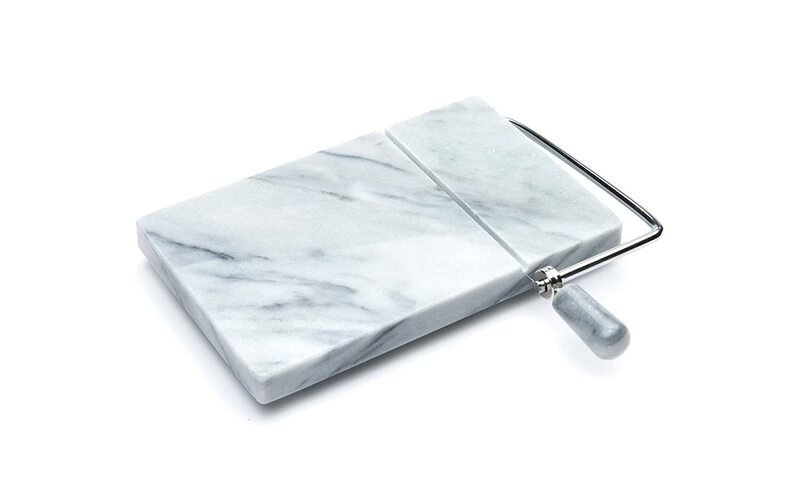 Elegant marble cutting board that will keep the cheese cool and fresh, and easy to clean as well. The product includes 2 extra stainless steel wire that you can easily replace. The marble cutting board might be prone to damage if not used and maintained properly. Another Wire type Cheese slicer is the Prodyne 805B Thick Beech Wood Cheese slicer. 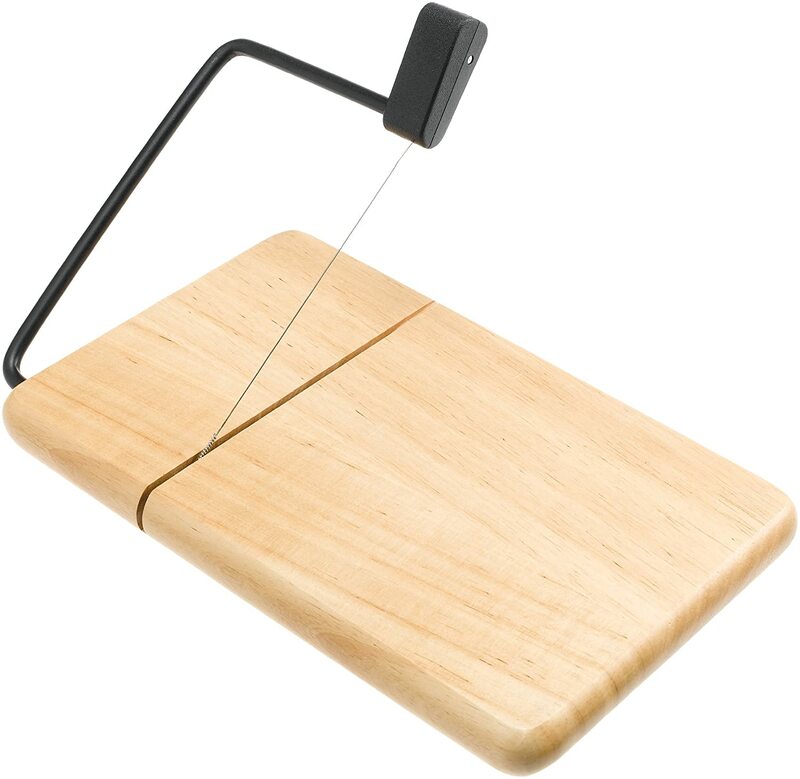 The unique feature of this cheese slicer is its beech wood slicing board that comes with an elegant black arm and durable handle grip. The stainless steel cutting wire provides easy cut through both hard and semi-hard types of cheeses for perfectly even slices whether it’s thick or thin. Its beech wood board comes with lightweight material for easy cleaning and rubber feet to keep it secure while cutting the cheese. The Manufacturer really cares about their customers because they provide replacements for the wire plus a lifetime warranty, pretty impressive. Elegant and lightweight beech wood cutting board that comes with rubber feet for easy cleaning and maintenance, and for security and safe operation. 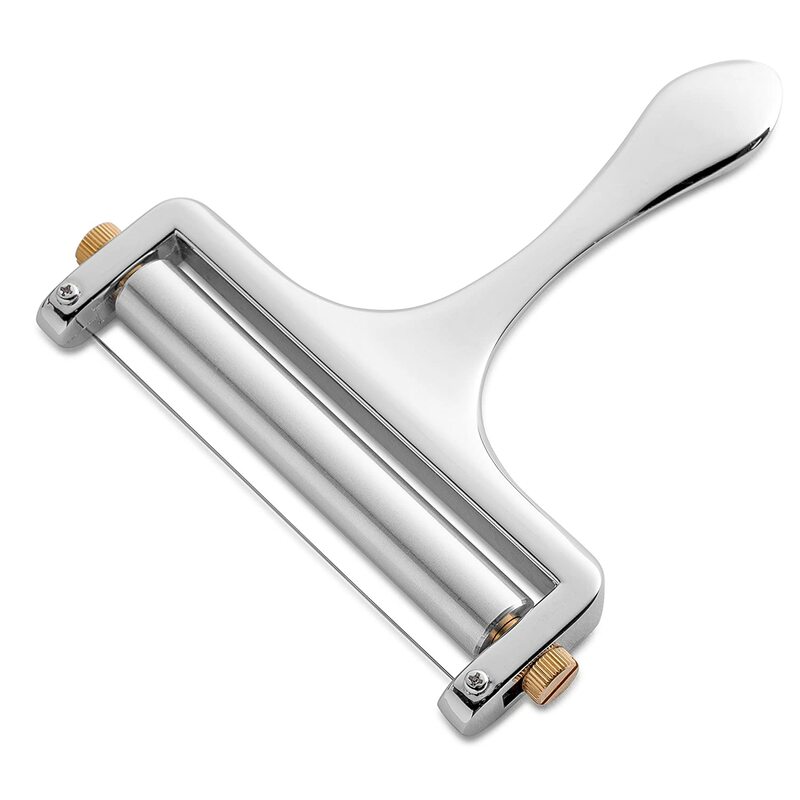 Versatile, it can cut through any hard, soft, or semi-hard cheeses due to its stainless steel cutting wires. The manufacturer offers wire replacements. The cheese slice might not be even. 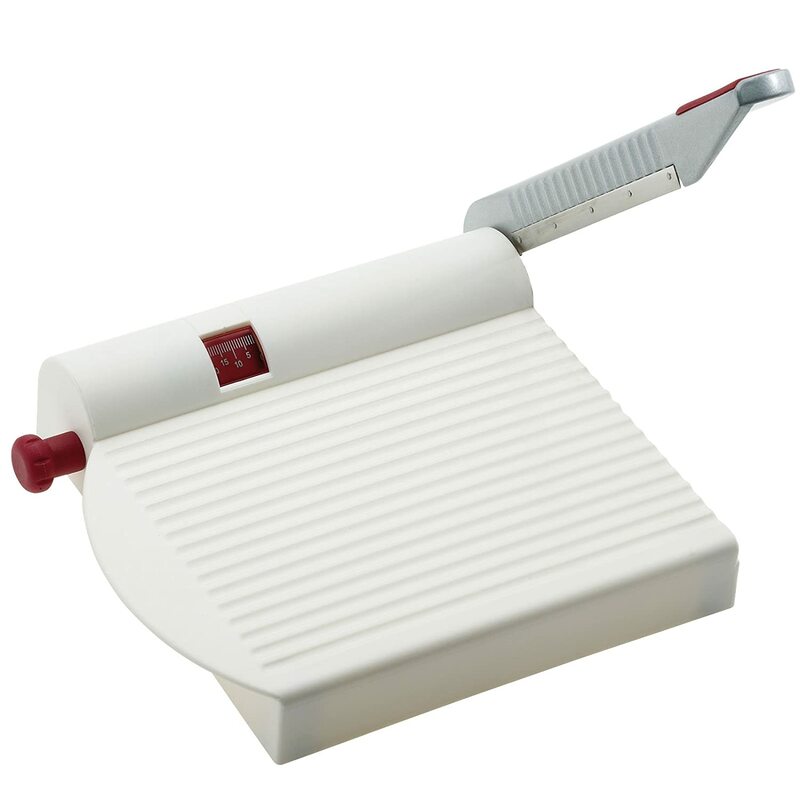 Manufactured by the Westmark Company in Germany, This cheese slicer comes with a plastic-made cutting board and a stainless steel blade cast in an aluminum handle that can cut through soft, hard, and semi-hard kinds of cheese. This slicer is not only great for cutting cheeses but it can also be used to slice other food like fruits and vegetables. The Westmark Multipurpose cheese slicer also comes with an ergonomic handle for comfortable operation. You can slice your food however you prefer with its adjustable thickness scale. You don’t have to worry about the messy cleaning because its slicing board is pretty easy to clean and maintain. This product is great because it’s packed with a 5-year warranty. However, this product may not be safe for your children because of the sharp of the blades. ABS (Plastic) cutting board for easy cleaning and maintenance. Versatile, it can cut through any soft or semi-hard cheeses and other food like fruits and vegetables due to its stainless steel cutting blades. Offers adjustable thickness for any desired food slices. May not be safe for your children because it has no safety features. Not your best choice for cutting hard cheeses. Last on the list is the OXO Wire Cheese Slicer. This cheese slicer can easily cut through any hard or soft cheeses with its tight and secured stainless steel wire controlled by tensioning wheel. The handle is made of zinc for maximum comfort, it also offers dishwasher-safe material so cleaning is never been easy. The good thing about this product is that it offers wire replacements in case of any damage. Comfortable handles and made from durable materials which are zinc. Versatile, it can cut through any soft or semi-hard cheeses due to its stainless steel cutting wires. Easy to clean because it’s dishwasher-safe. The product includes extra stainless steel wires that you can easily replace. May not give you even or uniformed slices. The slice thickness is not adjustable. Among the different cheese slicers listed above, which one is your favorite? Tell us below. All of the items on the list comes with different features, but our best pick would be the Bellemain Adjustable Thickness Cheese Slicer, here’s why. Bellemain Adjustable Thickness Cheese Slicer has a lot to offer, from its durable materials that will last for a long time, efficient and flexible slicing operations on hard or soft cheeses, and adjustable feature that allows you to adjust the size of the cheese whichever you prefer. Additionally, the manufacturer really cares about you because they offer extra stainless steel wire in case of any damage or breakage and the product is backed by a 1-year warranty. It has almost all of the features that every cheese slicers should have. Cheese slicer can be a great substitute to the regular knife when it comes to slicing cheese and certain models offer multipurpose for cutting any food such as vegetables and fruits. Choosing the best one will make you become efficient and smart in the kitchen.